If you’ve ever wondered where the western boundary of Echo Park’s Historic Filipinotown neighborhood is, tomorrow’s unveiling will mark the way. 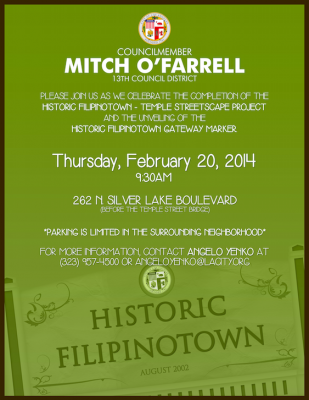 At 9:30 am on February 20th, Council District 13’s Mitch O’Farrell will unveil the Historic Filipinotown Gateway Marker and Temple Streetscape Project at 262 N. Silver Lake Blvd., just before the Temple Street Bridge. Join civic members and the community for the celebration! The blue star designates the meeting location, while the red star represents the Hi-Fi gateway marker.